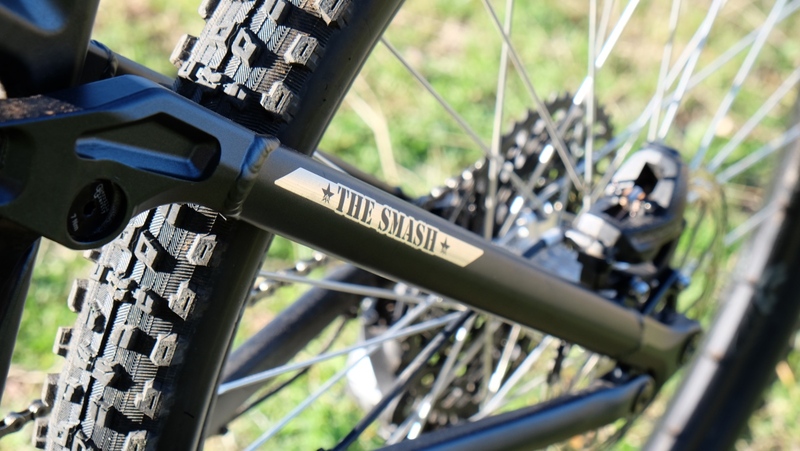 The Guerrilla Gravity Smash is built for going downhill fast. Introduced in 2017, the Guerrilla Gravity Smash is the bike maker’s big-wheeled brawler. The Denver, Colorado-based company has updated this enduro-ready rig with a bump in rear suspension travel from 140 to 145mm, slightly longer chainstays, a slacker front end designed around 160-170mm forks, and a customizable carbon frame. The revamped Guerrilla Gravity Smash has 145mm rear travel, slightly longer chainstays, a slacker front end designed around 160-170mm forks, and a customizable carbon frame. 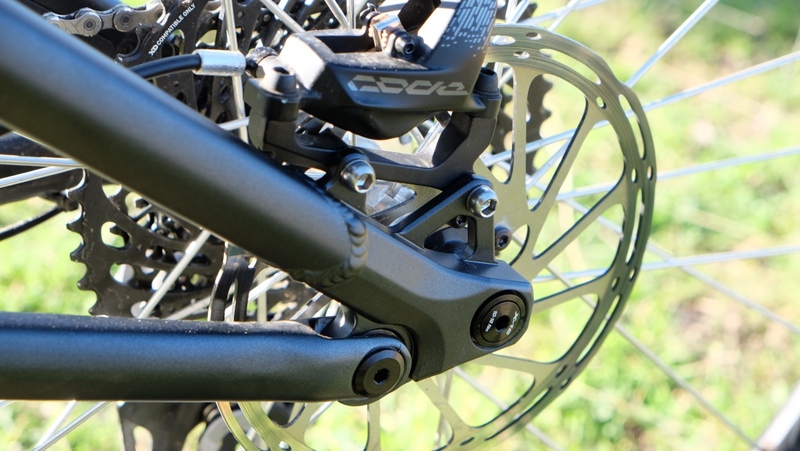 The carbon front triangle has adjustable reach and the modular frame gives riders the ability to transform their bike into Guerrilla Gravity’s three other full suspension models by swapping seatstays and suspension components. You can learn more about the company’s US-made carbon frame construction here. And if you want to know how Guerrilla Gravity turned one frame into four models, click here. Mtbr’s time aboard the Guerrilla Gravity Smash was brief but instructive. 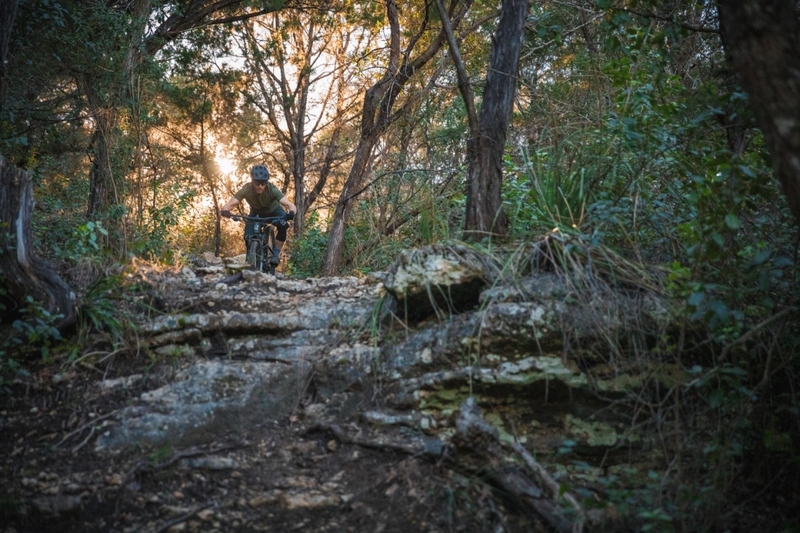 We spent a morning riding it on the blue, black and double black trails at the new Spider Mountain Bike Park, near Burnet, Texas, and an afternoon doing shuttle runs through a trail network in Austin. Mtbr rode Guerrilla Gravity’s Trail Pistol prior to testing the Smash. The bike, or at least most of it, was transformed from a short to long-travel trail bike through swapping the fork, shock and seatstays. It’s a straightforward process that a competent home mechanic can accomplish in around an hour. Guerilla Gravity considers its frames to be “shock agnostic,” meaning air cans and coils are both fair game. We found the Trail Pistol to be harsh in Crush mode, and thus opted to stay the course with Plush mode for our time aboard the Guerrilla Gravity Smash. 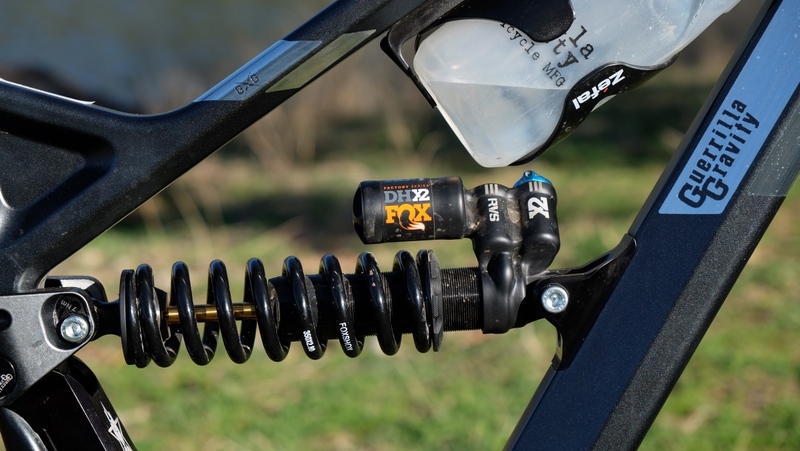 This setting with a coil shock did, in fact, result in a supple, yet supportive ride. 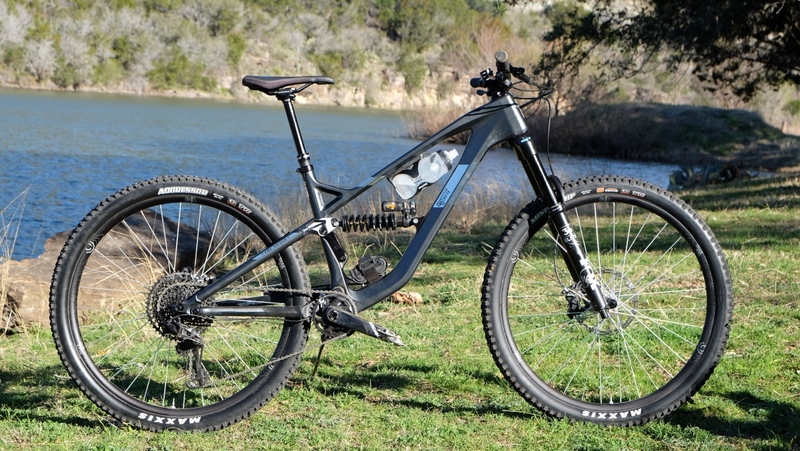 Guerrilla Gravity has done an excellent job of selecting a set of geometry numbers that result in a well-rounded ride. We did feel the need to flip the low-speed compression lever for the handful of extended climbs. We’ll need to spend more time experimenting with coils and air shocks in the Crush and Plush settings before weighing in on pedaling performance. 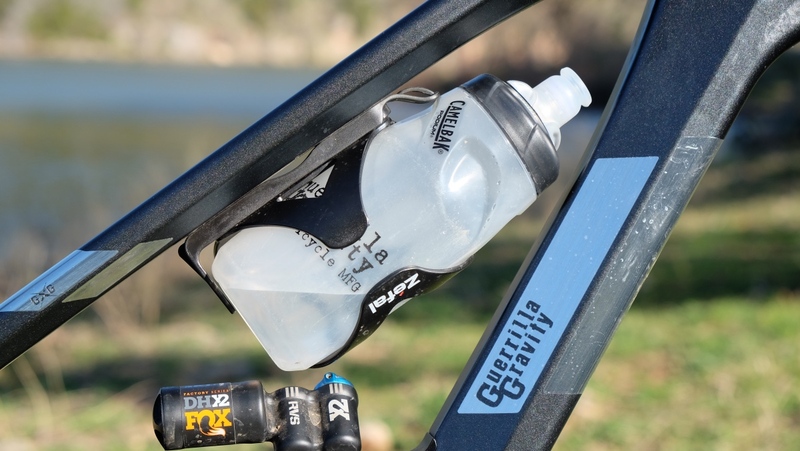 Guerrilla Gravity has done an excellent job of selecting a set of geometry numbers that result in a well-rounded ride. Suspension reservations aside, Mtbr didn’t find the Smash to be a handful on climbs. The steep seat tube angle keeps weight over the front, so as long as you give yourself room to swing the long front end through tight turns, the Smash is a willing climber. Water bottle storage is under the top tube. As the name suggests, the Smash is happiest descending with haste. Here, too, the geometry shines. 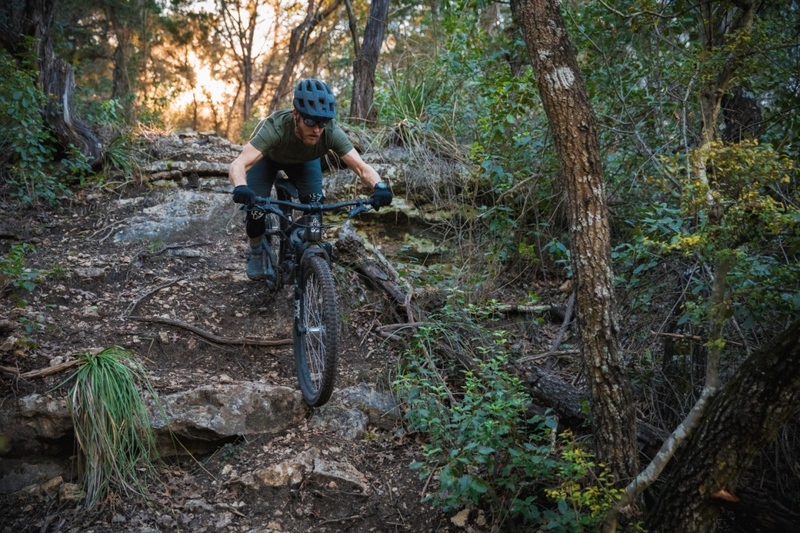 The slack head angle and long wheelbase were made for gobbling up rocky terrain. Guerrilla Gravity opted to stick with aluminum for the rear end. According to company co-cofounder Matt Giaraffa, there’s less to be gained from a carbon swingarm, especially when one considers how many alloy parts would need to be co-molded for pivot hardware. As a lightweight rider, I’m not one to test the limits of frame flex. But I did detect that the rear end seemed forgiving enough to keep tracking well through rocky turns when leaned over, rather than deflecting and chattering off line. 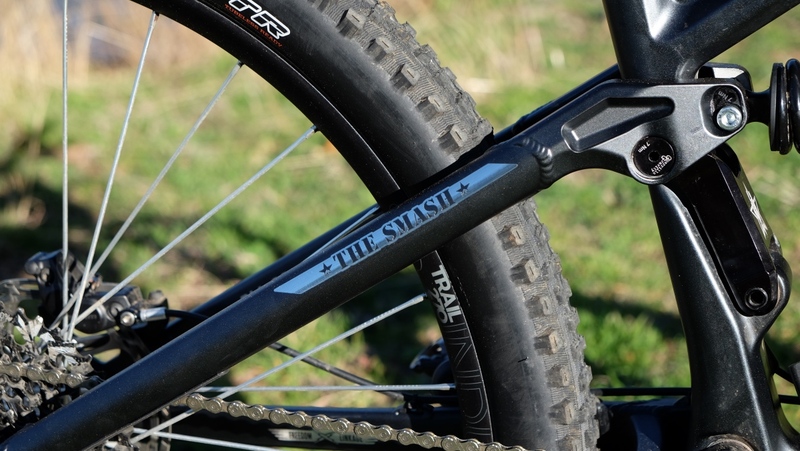 The Guerrilla Gravity Smash has an alloy rear triangle and carbon front. The Guerrilla Gravity Smash is fast and as adaptable as it needs to be. The seatstay, shock and fork swap from Trail Pistol to Smash gives riders the ability to invest in one bike to cover any terrain. Head to ridegg.com to learn more about the entire 2019 Guerilla Gravity line-up of bikes. Rear linkage of the Guerrilla Gravity Smash. The Smash was meant to do just that. Monster Energy AMA Supercross visited San Diego, California, this weekend for round five of the championship.